Sad to say, most Christians read a great passage like “The Love Chapter” as if it stands alone, oblivious to the fact that Paul wrote a letter not chapters. First Corinthians, like the rest of the New Testament, stood without chapter divisions for over a millennium…. 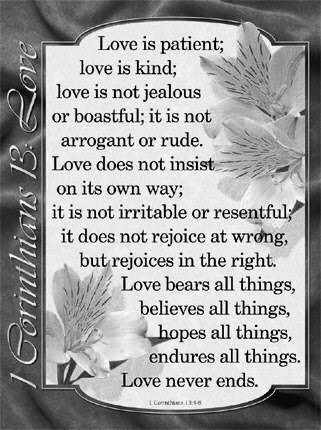 So, let us look at the context of love in First Corinthians. “knowledge puffs up; but love edifies” (v. 1). (5:8). Note the concern for truth in both passages. he was quoting Scripture itself (Deut. 17:7, LXX). the sake of the health of his bride, his people, he will not tolerate it. which temple you (pl.) are” (1 Cor. 3:16, 17). keys to this congregation’s well being. Trueblood’s, we make small what Christ made large. Why? to law against brother, and that before unbelievers”(6:5,6). explain away God’s word through today’s fads. those of the world are certainly singing theirs).